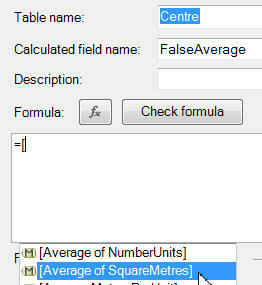 Import two tables: centres and centre types. The figures by type of centre. No need to create any calculated fields for this: you can just include the relevant fields in the VALUES section of the pivot table and change the Value Field Settings so that Excel averages, not sums, the data. The implicit measures will appear in autocompletion. The true average for any cell should be the average of the total square metres for that cell's query context divided by the total number of units for that cell's query context. The shopping centre figures are returning an error because one of the centres (Market Quay, as it happens) has 0 units in the database. To get round this, amend your true average so that it omits any figures where the number of units is 0. You can do this by wrapping your AVERAGEX function in a CALCULATE one. The figures are the same for the 3 centre types which didn't have an error - as indeed they should be, as nothing has changed for these. Save this workbook as Very average, then close it down.